The consensus is that the landforms we see today are based on the slow, constant processes of uniformitarianism. For instance, dogma stated the Grand Canyon began to get itself carved out by the Colorado River about seventeen million years ago. Catastrophism (major changes in much shorter periods of time) challenges that assumption, and some geologists are reconsidering the long-time view. Also, catastrophism has the advantage of having observational evidence, such as the canyon system formed after the Mt. St. Helens eruption. Riding over Georgia way, just east of the town of Lumpkin is Providence Canyon Outdoor Recreation Area. That's right, they've got themselves a canyon of their very own, and the start of it was blamed on bad farming practices, since those yahoos didn't really know how to care for the land. But the canyon started to form, and it kept on growing. Kind of makes you think about biblical catastrophism and the big scale version in the Genesis Flood, doesn't it? Many people believe canyons take a long time to form. In North America, though, there is a canyon that simply wasn’t there 150 years ago. 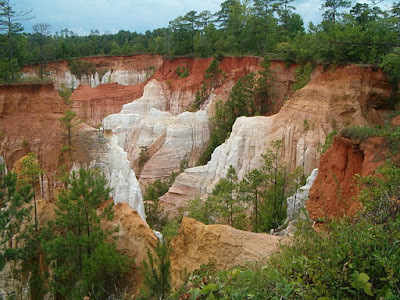 Providence Canyon is near the town of Lumpkin in southwest Georgia. Where there were once rolling hills covered with untouched pine forest, there is now a deep chasm with nine finger-like canyons. They range in size up to 50 m (160 ft ) deep, 180 m (600 ft) wide and 400 m (1,300 ft) long. The exposed canyon bluffs are extremely beautiful with many bands of different coloured rocks—bright red clay, white kaolin, as well as sands coloured ochre, pink, orange, beige, purple, lavender, grey, yellow, tan and black. To read the rest, click on "Canyon creation".